Back-to-school season is in full swing. Shopping for school clothes and supplies can be overwhelming, especially if you have more than one child. The best way to handle this time of year is to organize and plan accordingly and get all your shopping done and out of the way in one swoop. To have a stress-free back-to-school shopping trip that doesn’t cost an arm and a leg, you’re going to have to check out store sales and back-to-school deals to get more bang for your buck. Here are the top back-to-school deals being offered by retailers this year to help you save money. Target is one of my favorite stores for many reasons. I mainly love to shop there because they sell quality products for an affordable price, and they have delicious cheap popcorn. Last year, Target offered shoppers a gift card for spending a certain amount of money on school supplies in their store. It looks like they’re offering a $5 gift card for spending $30 on school supplies this year, and they still have some great back-to-school deals. They have notebooks, a pack of 8 mechanical pencils, a pack of 10 markers, and a 6 pack of Elmer’s glue sticks all for 99 cents. Athletic shoes are 20% off, and TI30 calculators start at $8.99. To view their complete ad, click here. Walmart is the king of affordability when it comes to shopping whether it’s clothes, food, toys, home accessories, and of course, school supplies. One of my favorite things about Walmart is that they are known for price matching, which is great for savvy shoppers who are always on the hunt for good deals. According to their 2016 price match policy, if customers find a lower price on the same product from another retailer, they will match that price so you can buy the item from them. The item must be identical and customers cannot price match private brands. This ensures you’ll get all your school supplies for the lowest prices. You can read more about Walmart’s price matching guidelines and the retailers they consider for price matching here. For school supplies this year, Walmart has so many items in the $1 or less club. This includes composition notebooks, crayons, glue sticks, colored pencils, crayon boxes, paper, binders and more. Graphing calculators are $88 and basic backpacks are only $4.97 each (offer valid through August 13). Character backpacks start at $9.98 and shirts for boys and girls are under $5. To view Walmart’s weekly ad and keep up with all the sales, click here. I don’t shop at Office Depot much, and it seems like I’ve definitely been missing out. This year, Office Depot has a really cool 1 cent sale. According to their promotion, you can purchase certain school supplies like erasers, markers, notebooks, and Elmer’s glue for 1 cent each after you spend $5. A pack of 25 round tip pins and a pack of 10 markers are both only 25 cents each. College ruled paper is only $1 along with pencils and binders. Flash drives start at $3.99. If you are looking for electronics, Office Depot has a big sale on Dell products with Dell tablets starting at $319 and a Dell laptop starting at $259 (regular price $379.99). You can view Office Depot’s full ad here. I love to shop at Walgreens around Easter and Halloween because I find some really great sales. My husband also has the Walgreens rewards card and I like their discounts for loyal customers. This year, Walgreens is offering $8 lunch boxes, backpacks starting at $4, 16GB flash drives starting at $5.99, and SD memory cards starting at $9.99 for rewards members. If you don’t have a Walgreens rewards card, don’t worry because you can always sign up for one. Customers can still get markers, crayons, notebooks, folders, and erasers all for just a dollar. Select notebooks, folders, portfolios, and planners are buy one get one free. You can view Walgreens’ weekly sales ad here. These deals won’t last forever and the various different sales offered by retailers this year has definitely motivated me to get out there and get my shopping done for the back-to-school season. Many of these deals are time sensitive and product availability is on a first come, first serve basis. If your child needs something specific this year, it’s best to avoid waiting until the last minute to search frantically for that item. Each of these stores has a weekly ad and some of their offers may change, so be sure to read the fine print and see how long these offers will be valid for. 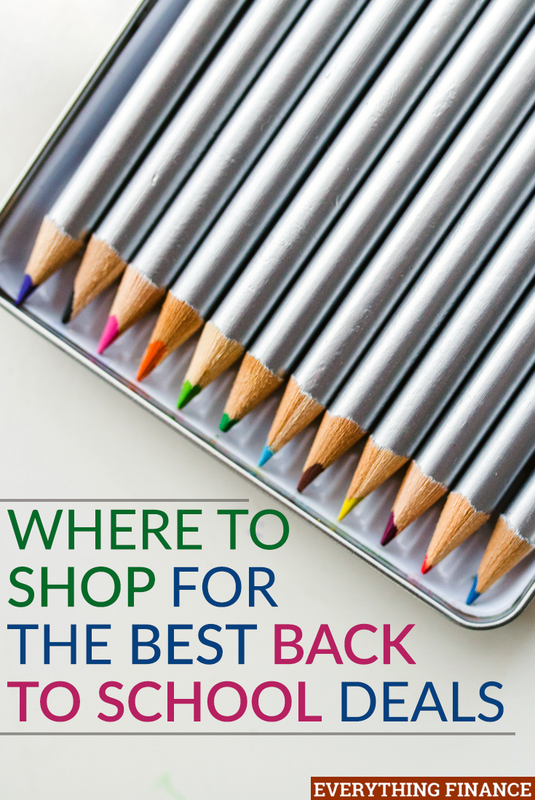 Where do you shop for the best back to school deals? Do you have any specific strategies you like to use to get the lowest prices? How Much Should You Pay Your Child to do Chores?